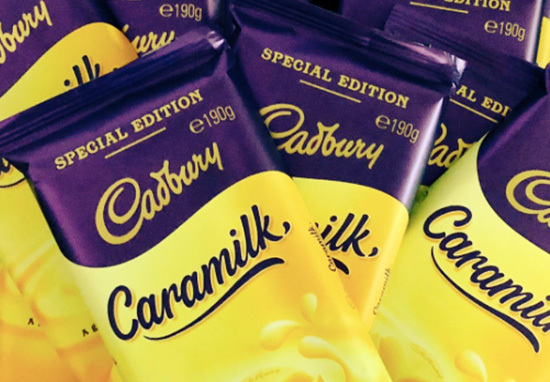 Chocoholics rejoice, because Cadbury is bringing back its legendary Caramilk bar as a limited edition – and resellers are already onto it. For those who don’t know, the bar combines white chocolate with caramel flavours – and while I’ve never actually had any, it sounds bloody delicious, but also, like a Caramac bar, but with Cadbury – you get the idea. The Caramilk bar was first sold in Canada 50 years ago, back in 1968. It was then sold in Australia and New Zealand in the early 1990s, up until it was discontinued in 1994. They were then brought back to New Zealand in July last year, but they were only available as a ‘limited edition’ – with just a million bars being made. Yet, alas, it’s lucky Australia enjoying the return of the Caramilk but again, it’s a limited edition and is being retailed at approximately £1.69 per bar. At retail price that is because people have been making the most of being able to get their hands on it and are selling them online – at much higher prices. What’s the exchange rate of Bitcoin to Caramilk squares? When I say ‘much higher’, I’m really not joking. People are suggesting it’s the ‘new Bitcoin’ and are rumoured to be selling it at $10 a square. What!? OK, so Cadbury brought out a limited edition ‘Caramilk’ chocolate… Sold out everywhere, now they are on eBay for $19.00 a block… CadburyAU this is a joke. Ease up on the banter Cadbury. The shame at being one of those people standing out the front of the supermarket close to opening time was justly rewarded with scoring two blocks of Caramilk, want one nitrojane? Supplies are somewhat limited at local Coles. The love of my life has suggested that the ‘choc-blockchain’ [caramilk] is our ticket to financial security, so I guess what I mean is does anyone need a boyfriend? 20 blocks as requested @ajobbins ? As you’ve probably already guessed, Caramilk isn’t on offer in the UK, yet.